Brief:Your task is to create an automated machine capable of neutralising a suspected bomber. There are several limitations to consider. 1. The targets are live, intelligent human beings in a heightened state of alertness. Their awareness of their surroundings will be keen. The machine must be able to approach the target without alerting suspicion (whether through concealment or inconspicuosity). 2. The target is assumed to be carrying live explosives. The machine must be capable of suppressing an explosion in the event that the explosives are detonated. 3. Due to the tense nature of the political situation in a world that has been quickly transformed from ideal to dystopic, many people will be falsely identified as terrorist targets. The machine must be able to suppress the explosive and the suspect using NON LETHAL means. How you, the designer, approach this problem, will have a big effect on the outcome of your design. Deadline: 2 weeks again. I will be in Europe when this is due so I will find someone to take over. Only finished one part of it, no prizes for guessing which part . Hopefully I'll get to finish the second part this week, and not fail to finish again. Its an electric craft that docks when not in flight, but uses its lenses to scan an assigned area from a high vantage point, searching for "unusual" human behaviors that would suggest paranoia or an overfocus on a nearby structure. This imaging ability, coupled with sensors detecting the faint traces of bomb materials that escape any explosive device allow the sentinel to minimize accidental tracking. Low profile is the key to catching terrorists. The craft would then fly at high altitude virtually silent to observe the subject more closely. 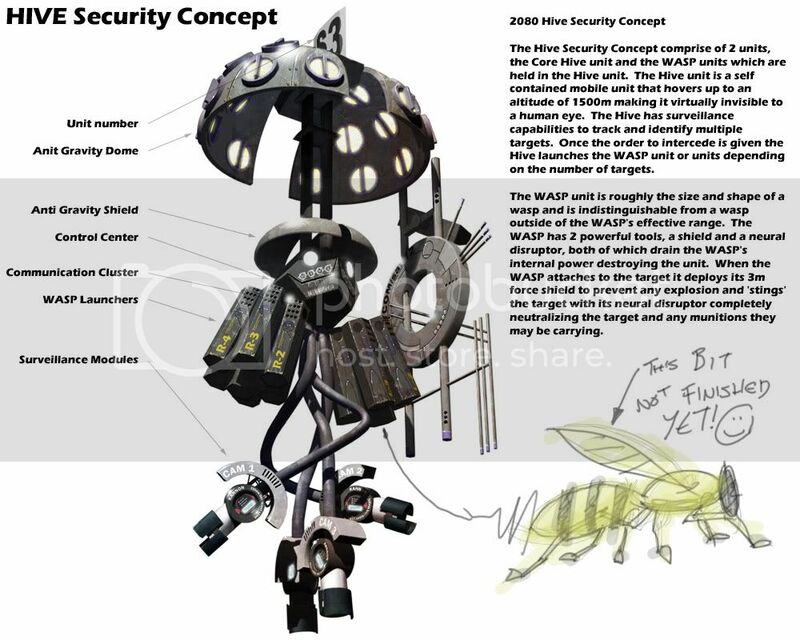 If targetted for full scan, the sentinal descends from directly overhead and fires 4 spikes connected to guide wires, to allow for containment / scan rings to follow their guide wires. Simultaniously the sentinal fires an electrode (or both, depending on size) into the upper neck of the subject, rendering he or she paralyzed in the upright position. The rings descend around the subject, scanning for bomb materials, and giving the AI a 3dimensional mapping of the subject and bomb. If bomb is not present, sentinal retracts into its normal positions, including electrodes (rendering subject mobile), and dispenses a recorded apology / thanks for cooperation. If bomb is present, 4 retractable arms will then descend the wires operating in unison to attempt defusal, capable of accessing any height within the ring containment along the wires. If bomb detonates, blast will be contained by the rings, forcing it upwards through the sentinal itself. Thus, the robot is designed to streamline in order to minimize its damage, to return scan data in tact to either its respective dock, or through human retrieval at the detonation sight. If bomb can be removed, sentinal can lift off with bomb in claws to defuse / detonate in safer location - a larger electric charge down the electrode will render the subject paralyzed in the fetal position until authorities arrive to detain him / her, following the Sentinal's tracking beacon. Subject will only remain in containment if nessecary for sake of safety of others (if suicide bomber), or if electrodes fail to immobilize. A suicide bomber's life is, however, deemed less important than that of nearby citizens in the AI's processing- and will take no regard to release the containment rings if the bomb can not be removed nor defused. Last edited by KuJo; July 25th, 2006 at 05:55 PM. No!... Maybe..... Look, that was six weeks ago. kujo if you rework it may i suggest moving the elements around so it is clearer which text goes with which drawing. Other than that, looks great. Defuse_ uses T-rays (link) to detect the presence of plastic explosives, biological/chemical weaponry and arms. Further identification should be used for those permitted to carry such items, so that the Defuse_ will not neutralise a friendly target. Once a target has been identified the unit communicates with other units to produce gravity waves (or gravitons) which constructively interfere at the target to temporarily unravel hidden dimensions (see: string theory) which then enclose on the target, trapping the target in a hidden plane of existence until law enforcement agencies can assess the situation and determine whether the target should be retreived or, in some cases, left for eternity just beyond sight. Last edited by Flip; August 27th, 2006 at 10:20 AM. Research shows Industrial Design of the Week is addictive. Is anyone else doing this IDW? *pouts* I wanna see artwork..
i have an idea but its still in sketch form. if i can work on it after work tonight and tomorrow morning ill post it. lol no its not that I just love seeing what people come up with - I'm aspiring to go into Industrial design for gradschool, and enjoy the mechanical stuff people think up even more than the creatures and such (which are awesome enough) - there are people here with such insane talent / skills .. guess I just figured there'd be people jumping on this IDW like all the others the moment it popped up who knows, maybe I'll be pleasantly suprised in a week or so? How many entries do we need to move this to poll? If it'll help it along I'll come up with something this weekend. Last edited by Tenno; August 13th, 2006 at 06:51 PM. IF THIS POST DOES NOT CONTAIN SKETCHES OR PAINTINGS - REPRIMAND ME! It'd be a shame to take only 2 entries to the poll. You can expect an entry from me (finally ) over the weekend. The Defuse MX4200 is an all in one detection and containment bomb unit. It features a highly maneuverable hover drive system allowing it to operate in virtually any environment. If a bomb threat is detected, the MX4200 features a high pressure cannon that disperses an explosion absorbing and immobilizing foam agent upon any target. Can we still expect one from you Flip? im still in europe for a few more days, as i SAID above, i will changeover when i get home. Hopefully, I'll try for one over the weekend, got distracted last weekend. EDIT: I WILL work on it tomorrow. I pwomise. Last edited by Flip; August 21st, 2006 at 09:09 AM. It's either super-awesome, or Flip got distracted again. Well flip can i close it up? Also who wants to take over this thing and run it how you want to? I am working a full time concept job now plus two full time freelance gigs so i just dont have the time to think about it. Someone should just throw up a new IDW idea - maybe something new would spark some interest like the previous weeks had.. I'm afraid it was definitely the latter. Sorry to hold up the next topic. I don't mind doing it if you can't spare any time (as much as I've said otherwise). It's unfortunate though, your topics have been great. Guess you're the only taker Flip. I say someone just move onto a new topic and pump some life into this section asap..
flip has davi given you permissions yet? Not yet, when I do I'll put up the voting and new topic thread. New topic thread can be found here. Voting thread can be found here. Last edited by Flip; September 12th, 2006 at 09:00 AM.